Place ribs in 3 1/2- to 4-quart slow cooker. Top with bay leaves, Worcestershire sauce, gravy mix (dry), wine and soup. Spoon excess fat from top of sauce if desired. Remove bay leaves. Serve ribs with mashed potatoes, spooning sauce over all. 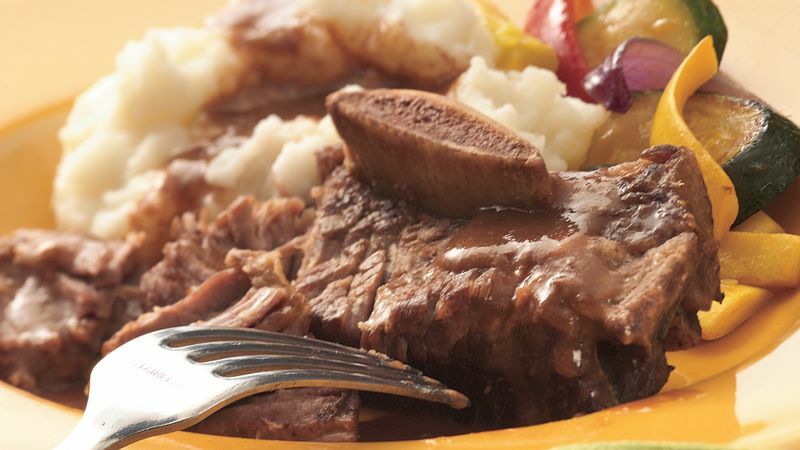 Try cooking a 3-pound pot roast this way. It's just as delicious but not as rich as the short ribs. Steamed baby carrots brighten up the plate. They also taste great with the sauce. Serve in pretty shallow soup plates with a fork and spoon to get every delicious drop of sauce.